Any football ground enthusiast worth their salt cannot have failed to have heard of stadium architect Archibald Leitch. 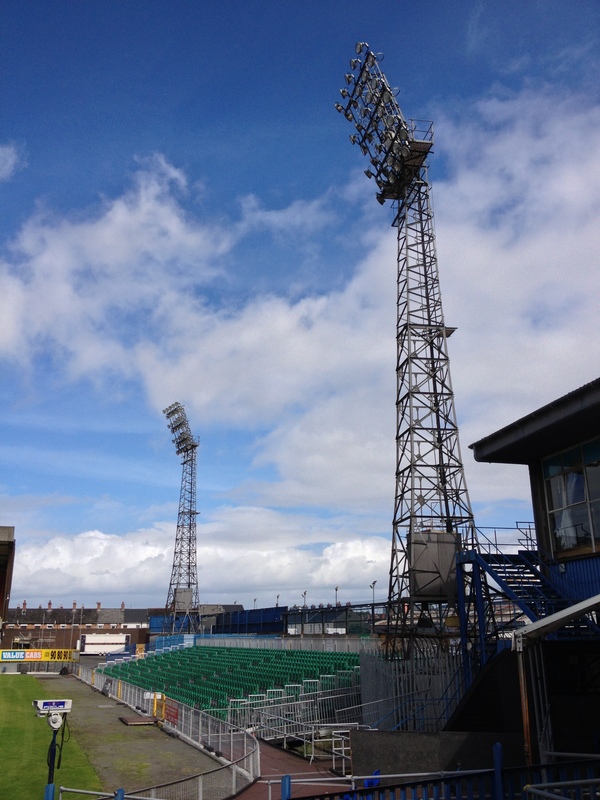 A legendary name responsible for the design of thirty stadiums in the United Kingdom, Dalymount Park in Dublin and a plethora of small commissions and design accreditations. Working prolifically between 1899 and 1935 his architecture and design styles became as seminal as they were readily identifiable. Scaled according to budget available they would involve a sizeable main stand, usually with the trademark Leitch roof gable and finial, and substantial terracing with the patented crush barriers, a lesson gleaned growing up in Glasgow and witnessing huge crowds at the Victorian grounds of Rangers, Celtic and Queen’s Park. Sadly such is the clamour for modernity that many of his grounds have either gone (Ayresome Park, Roker Park, The Den, and Leeds Road) or have been substantially altered. Thankfully some of his iconic work remains in service and looking as stunning as ever, notably at Rangers, Hearts, Everton and Fulham. 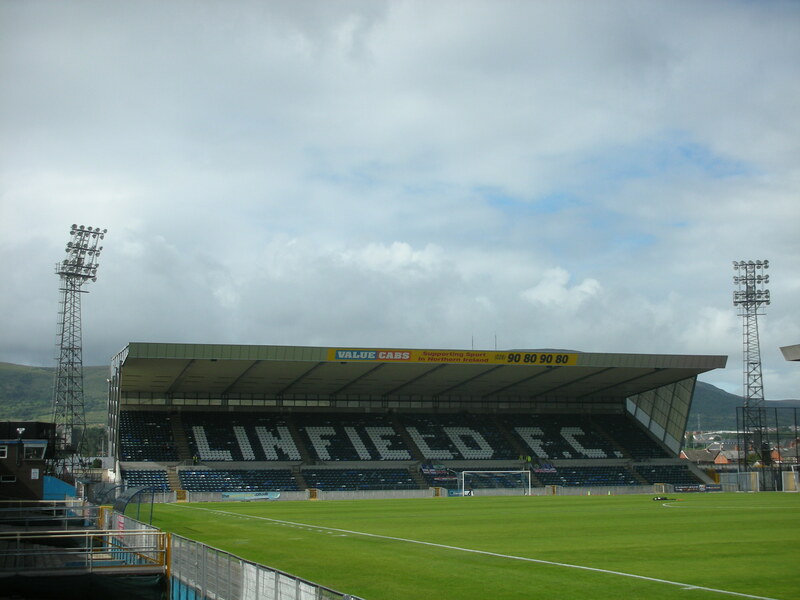 Having finally chalked off Tynecastle a couple of years ago the last remaining Leitch ground eluding me was Windsor Park, Belfast home of “The Blues”, Linfield, 51 times champions of Northern Ireland. On hearing that the South Stand at Windsor, a 1930 Leitch attributation, was due for demolition and replacement in October of this year a long overdue visit became absolutely essential. As luck would have it a long weekend in Belfast meant I could take in a game on Friday night and then attend the “Big Two” derby with Linfield’s arch rivals Glentoran on the Saturday. 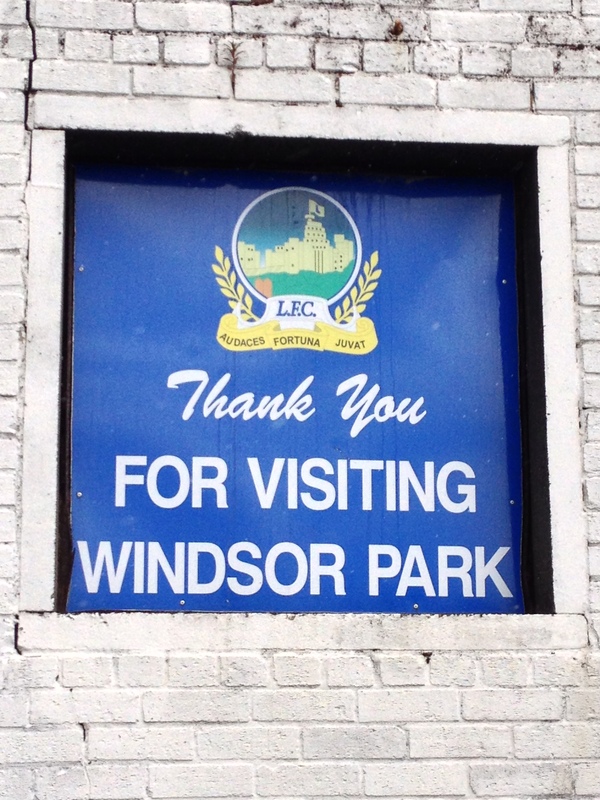 The Blues have played at Windsor Park, originally called Bog Meadows, since 1904 having previously played at a field behind the Ulster Spinning Company’s Linfield Mill close to where the club was formed in 1886 in Sandy Row. Three years after formation the Blues moved to a ground in Ulsterville Avenue before the move to South Belfast and a then modest field just off Lower Windsor Avenue. The club’s first opponents at the new Windsor Park ground in September 1905 were, ironically, current nemesis Glentoran. 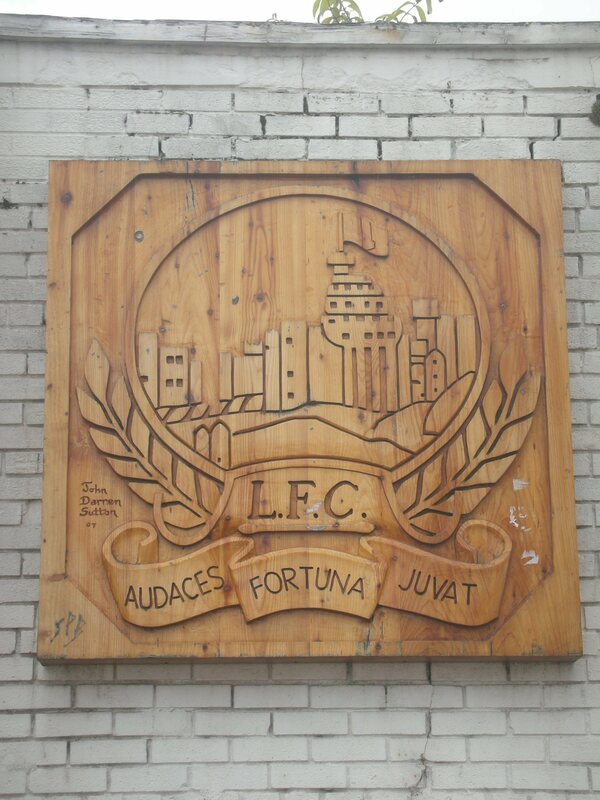 Linfield’s traditional major rival was Belfast Celtic who folded in 1949, so now it is the Glens from East Belfast that makes up the “Big Two” mantle. Linfield’s contribution to Northern Irish football is unquestioned, easily the most trophies won of any club and some of their past players are a veritable who’s who of Irish football. Tommy Dickson, Elisha Scott and Joe Bambrick are just a few of Windsor’s glittering alumni. 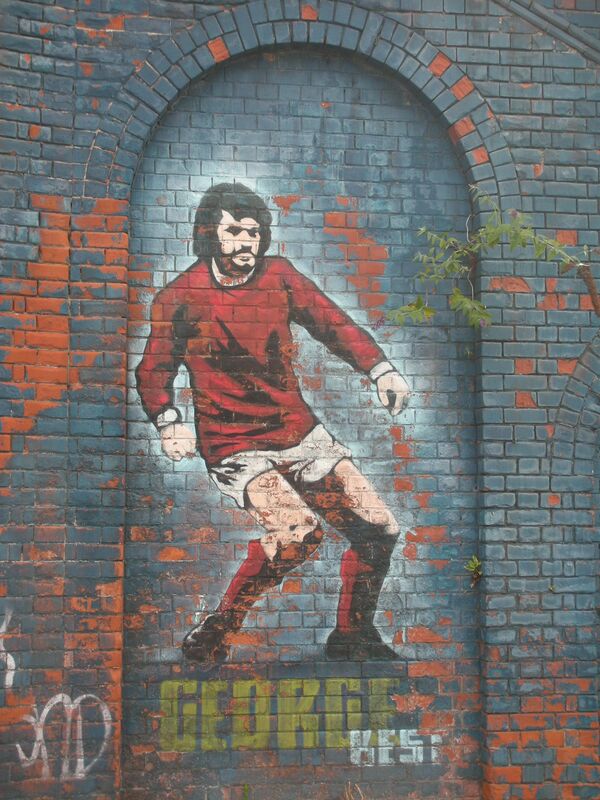 The ground and surrounding areas drips in history, wall murals are everywhere commemorating the achievements of both the club and country, the image of George Best on the railway bridge wall is stunning. 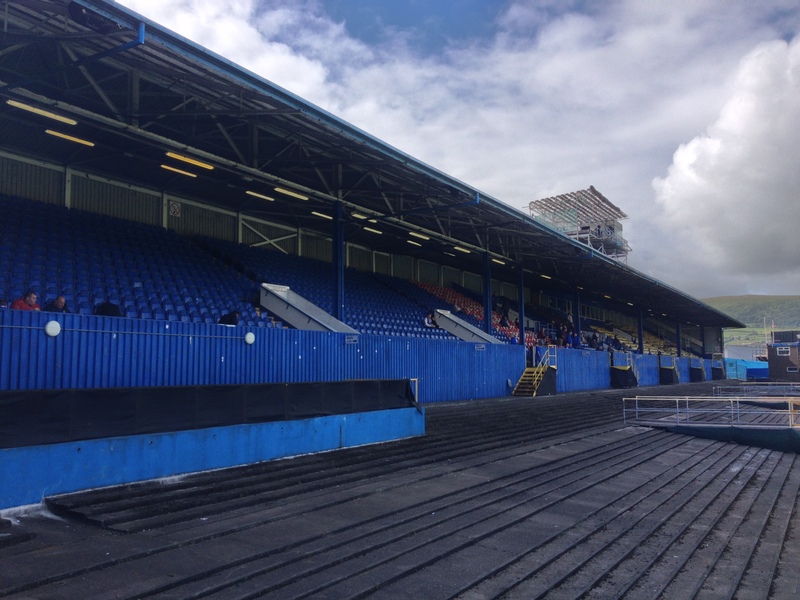 The ground is at a crossroads, two relatively modern stands, the Leitch masterpiece, and the railway end which currently has temporary uncovered seating. 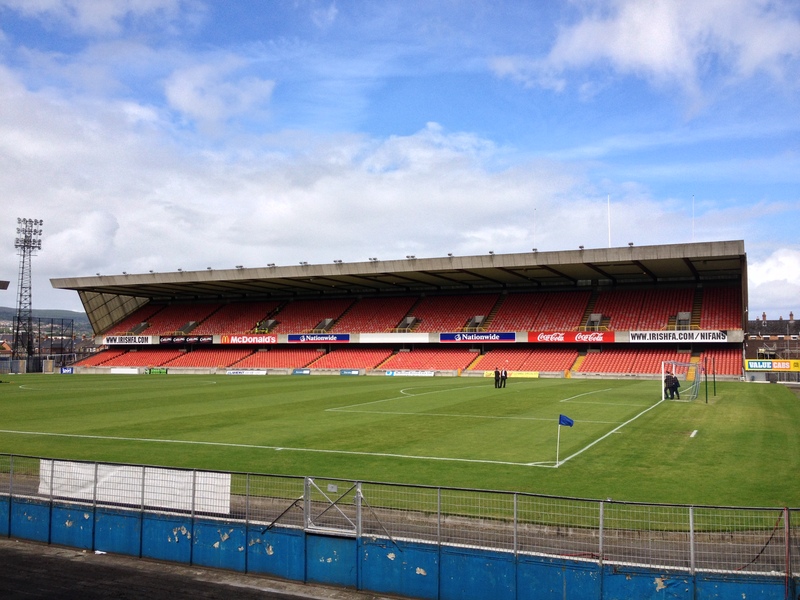 The proposed redevelopment of Windsor Park has not been without controversy. The £29.2 million project would see new South and East stands and refurbishment of the more modern North and West stands. The controversy centred on the funding of the project, all but £4 million coming from the government. A rival club, later named as Crusaders, applied for a judicial review of the funding citing European Union competition laws and State aid laws as a valid reason. The men from Seaview claimed the funding represented a massive advantage being handed to Linfield. Fact of the matter is the national team need a more modern facility to progress and while the Leitch stand has the iconic trademark touches it is well and truly in its dotage years. 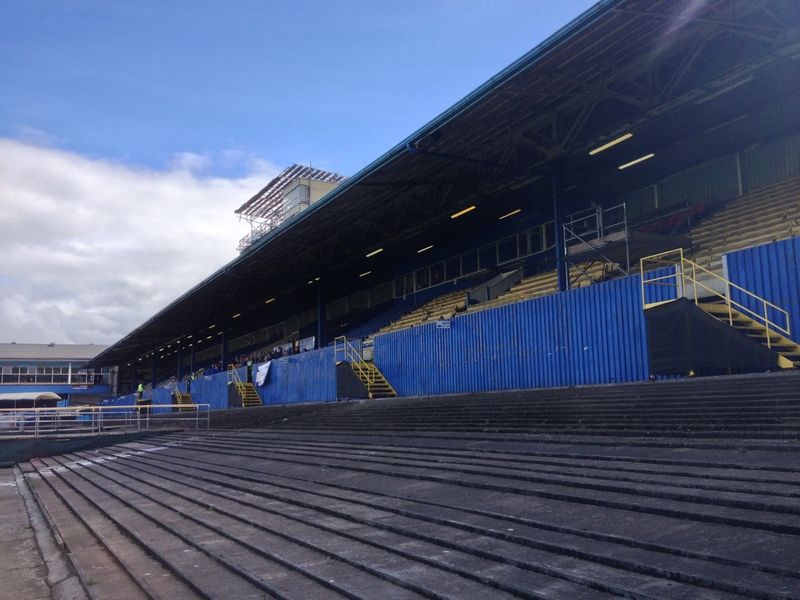 The substantial terracing in front of the stand is cordoned off and some sections of it are in poor condition. The match is eagerly awaited, Linfield are, unbelievably, bottom of the formative 2013/14 league table. Seemingly suffering from a malaise since last March, their run in to the end of last season was little short of wretched. The Glensmen on the other had have been beset by financial woes. They have been shorn of some key players due to budget cuts, notably Jamie Mulgrew, Andrew Waterworth and Sean Ward have swapped Green shirts for Blue in recent times. Ward in particular is singled out for a hard time from the massed ranks of Glens fans in the upper section of the North stand. Tackles rain in and goalscoring chances are few and far between. The home crowd get restless, manager David Jeffrey is a man under pressure. His task is not helped half an hour in when Aaron Burns is shown a straight red card. He protests his innocence, while markedly his team mates do not harangue the referee. I am unsure what caused the dismissal, a voice behind me offers helpfully that “he gubbed him so he did”. The Blues have a mountain to climb but stick to their task manfully and arguably have the better of the chances. Yellow cards come thick and fast, all justified under the current interpretation of the tackling laws, and there is no real surprise when numerical parity is restored when the visitors’ Jason Hill makes a second injudicious tackle having been carded only ten minutes previously. The sides pummel each other searching for a goal. Late on it looks like young left back Niall Quinn was going to be the local hero bursting clean through but his left footed drive produces a wonder save from Elliott Morris on his 501st appearance for the Glens. The match ends goalless which means Linfield remain rooted to the foot of the table but they can take solace from their tremendous performance with ten men for an hour of the match. 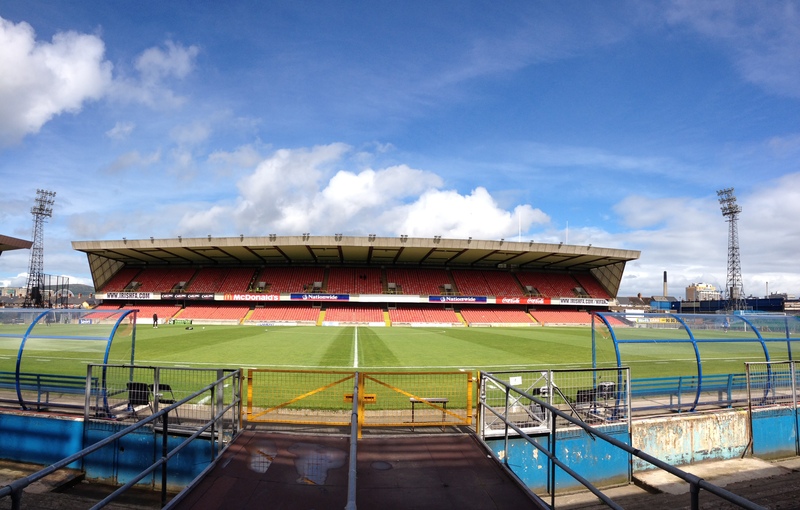 The modern Windsor Park promises to be substantially different to the way the ground looks today. 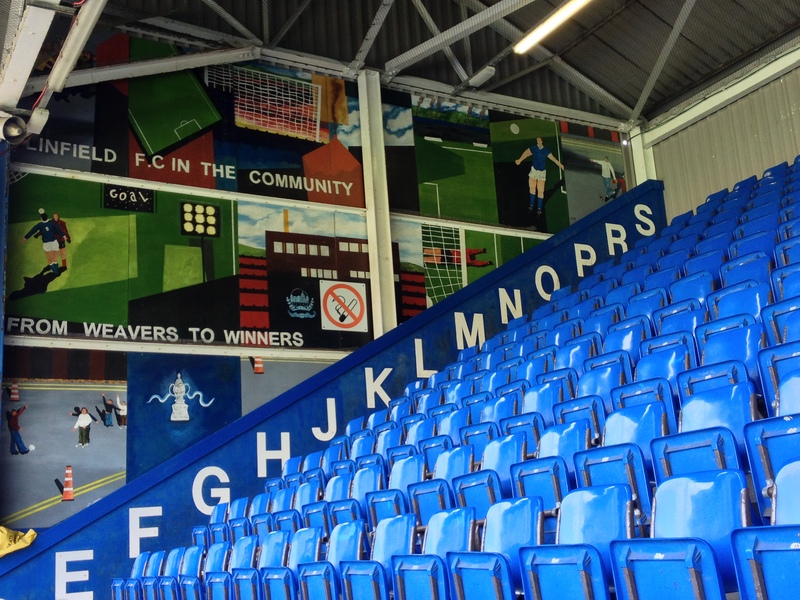 I loved my visit to Windsor Park, a real football ground, a living, breathing monument to social and sporting history. It is also with no little sadness that my days of “Chasing Archie” are at an end. 33. Jonathan Tuffey; 12. Billy Joe Burns; 31. Niall Quinn; 3. Kyle McVey; 15. Sean Ward; 4. Michael Gault (c); 22. Jamie Mulgrew; 10. Michael Carvill; 14. Aaron Burns; 18. Matthew Tipton; 25. Mark McAllister. 9. Peter Thompson (for 18, 70 mins); 16. Matthew Clarke; 17. James Knowles; 21. Jim Ervin (for 12, 78 mins); 24. Brian McCaul. 1. Elliott Morris (c); 2. Ryan O’Neill; 15. Jason Hill; 17. Jimmy Callacher; 22. Calum Birney; 14. Niall Henderson; 12, Mark Clarke; 16. Stpehen McAlorum; 3. Marcus Kane; 19. Jonathan Addis; 20. Jim O’Hanlon. 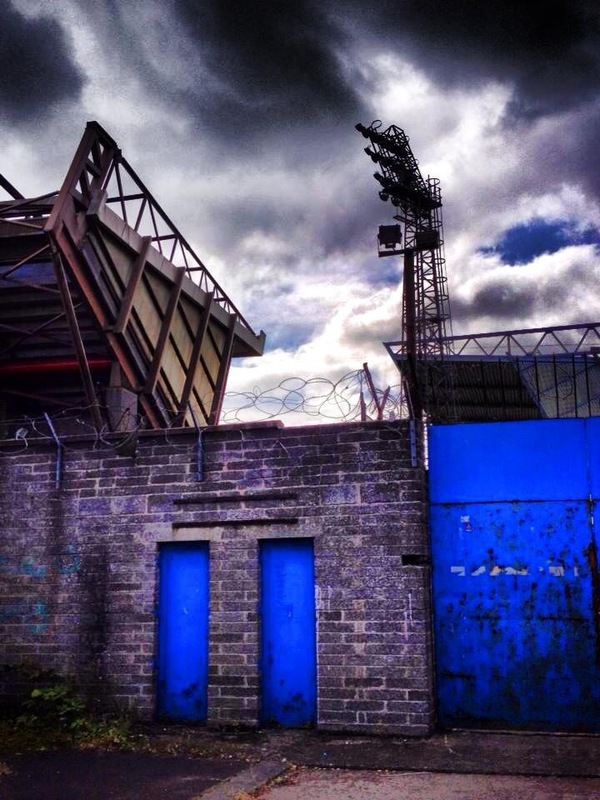 This entry was posted in Travel, Matches & Stadiums and tagged Archibald Leitch, Belfast, Blues, Danske Bank Premiership, Glens, Glentoran, Irish football, Linfield, Northern Ireland, Windsor Park by peterrmiles. Bookmark the permalink. great pics and article! Still ruing the loss of the Leitch stand at White Hart Lane, an absolute wedding cake of a grandstand!